﻿ Riad Dar Meryem Marrakech. JIMAT di Agoda.com! Ada soalan mengenai Riad Dar Meryem? Dengan lokasi mudah di Marrakech, Riad Dar Meryem adalah tempat yang hebat untuk menjelajahi bandar yang menarik ini. Dari sini, tetamu boleh menikmati semua kemudahan yang bandar ini tawarkan. Bagi anda yang ingin pergi agak jauh, Artisanat Dar Essalam, Tanneries, Farnatchis merupakan beberapa daya tarikan untuk pelawat. Ambil kesempatan daripada pelbagai perkhidmatan dan kemudahan yang tiada tandingan di hotel Marrakech. Tetamu boleh menikmati kemudahan seperti khidmat bilik 24 jam, Wi-Fi percuma semua bilik, pendiang api, daftar masuk/keluar peribadi, pengemasan harian. Tetamu boleh memilih dari 6 bilik, semuanya yang akan memberikan suasana ketenangan dan keharmonian. Kemudahan rekreasi hotel, yang termasuk seperti kolam renang tertutup direka untuk anda melarikan diri dari masalah dan bersantai. Apapun alasan anda untuk melawat Marrakech, Riad Dar Meryem adalah tempat yang sempurna untuk percutian yang menyeronokkan dan menarik. Loved this place and next time we're in Marrakech will stay here again. We stayed st the Riad Der Meryen for two nights and absolutely loved it. The place is beautiful! And although it can be hard to find at first, it's in a great location right in the medina. The staff was so friendly. The breakfast was delicious. Definitely recommend this place. The host and helpers in the risd are very nice and helpful!!! Good to stay there again. I can't say the location of the riad is convenient. It situated in narrowed small streets in the medina area. It takes around 15 minutes to walk to the Square Jamaa el Fna. 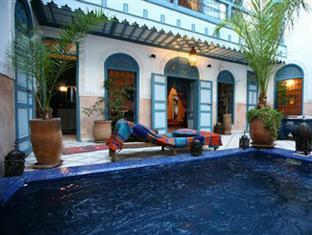 Fantasic, the staff were great and i cannot recommend this Riad enough. We have a son who has a tree nut allergy and we do not speak French, but the staff at the Raid were so helpfull and understanding it was really great. The Riad itself was a great haven away from the streets in the Medina as well and its was a beautiful place. A great stay in this Riad, everything just as we expected or beyond, staff are attentive even they don't speak a lot of English. Don't miss the dinner in the Yard and Drinks/view on the terrace, as well as hammam and massage that can be booked via the Hotel. First of all I would recommend to make an arrangement with the Riad to get collected from somewhere as it is pretty difficult to find. We arrived at midnight and fortunately we booked an airport transfer so we were pretty relaxed as we saw our name on a sign of a driver. As we approached the Medina it was obvious for us that we never would have found this Riad on our own. We were warmly welcomed in the Riad. We liked our Zagora room very much as it had "1001 nights" style and was very spacious and quiet with an also spacious bathroom. The whole team from the Riad was also very nice and helpful at any time. Our breakfast was the hightlight of every morning as it consisted of local pastries which we liked very much. Furthermore we also had dinner in the Riad and we definitely also enjoyed that great food within the calm and quiet atmosphere of the Riad inside the bustling Medina. It felt definitely always like coming home when we arrived at the Riad after a long, colourful and intensive day in Marrakesh. On the first day we were guided to the souks and to "la place" so that we could try to remember our way (which was definitely very difficult in the souks of Marrakesh ;) On our departure we also were guided back to a place were we got picked up. So all in all we had an amazing stay at Riad Dar Merjem which has great Moroccan charm and definitely perfect Moroccan hospitality. Thanks for making our vacation so perfect. Not too bad. Quite good breakfast. Make sure you call ahead and ask them to meet you - a little difficult to find. Staff have limited English. Personalen tog bra hand om oss.Rent och fint. Kändes säkert. Nettes und ruhig gelegenes Riad eine Oase der Ruhe in der Medina. Eine Oase der Ruhe in der trubeligen Medina. Sehr schönes Riad, kleiner, aber sehr netter Pool. Es war einfach ein toller Aufenthalt. Ein immer gut gelaunter Gastgeber hat uns ein sehr leckeres Dinner im shönen Innenhof zubereitet. Das Riad liegt etwas versteckt in einer Seitengasse. Aber die Anreise lohnt sich. Es ist sehr ruhig und idyllisch. Man ist direkt an den Souks und in 15 Minuten am Djenna El Fnaa. Un'oasi di tranquillità e silenzio in cui rifugiarsi dopo l'assalto continuo di commercianti e imbonitori vari. Piacevolissimo il bagno nella piccola piscina nel cortile del riad, autentico e molto curato. Arredamento e tessuti splendidi, cura dei dettagli, charme marocchino vero. Ottimo wi-fi anche in camera. Proprietario molto disponibile che ha fornito preziosissime indicazioni disegnandoci la mappa per la piazza (all'inizio ci si perde un pò di volte!...). Posizione buona per chi arriva in auto (parcheggio dalle Poste a circa 400 metri). Splendido lo consiglio a chi vuole stare in una piccola oasi di pace.